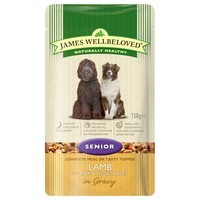 James Wellbeloved Senior Dog Food Pouches (Lamb with Rice & Veg) are a complete hypoallergenic wet food, suitable for dogs 7 years or older and small breed dogs that are 10 years or older. The delicious recipe has been balanced carefully to ensure your older dog receives all the nutrients and vitamins they require, and contains ingredients that support the joints, heart, and immune system. James Wellbeloved Senior Pouches are ideal as a tasty topper or a complete dog food.